I’ve been reading Rebecca Solnit’s latest resonant book The Faraway Nearby, and every day there’s a new discovery—about writing, about alienation, about the uses of stories. This morning’s passage evoked the web of interrelatedness and care that can happen among neighbors and friends. In the author’s case, a cancer diagnosis showed her how much goodwill she had banked. People came from everywhere to help her. In some parts of the world, surely this beautiful indebtedness is still the norm. In my neighborhood, it’s making a steady return, in many small ways. Some intertwined examples from this past week: I put a call out for dill on the Facebook Neighbors Garden page, offering other herbs in exchange. 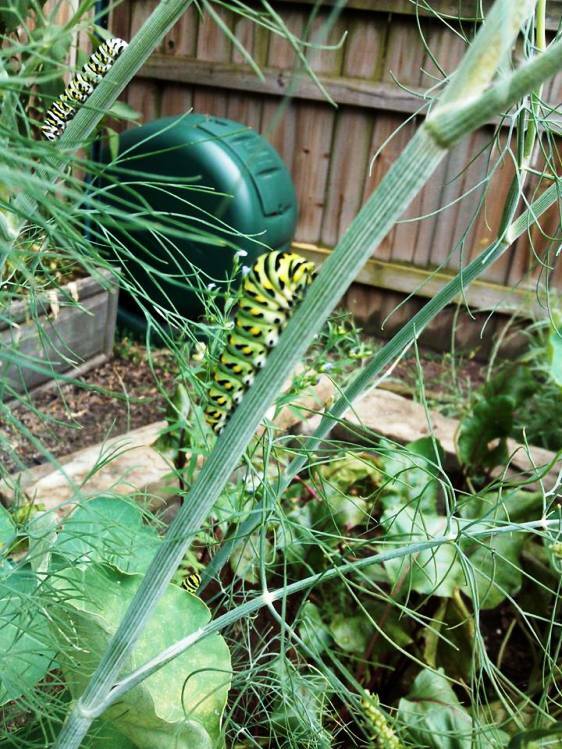 I’d planted dill, but the black swallowtail caterpillars ate every single sprig of it. I wasn’t too sad about the loss, knowing the beauty that would come of it—until I saw the enticing baby cucumbers at the farmers market and ended up buying three pounds’ worth. I wanted to make a crock of pickles. Happily, Amy of Fraudulent Farmgirl fame offered her unused dill. Over the weekend I biked over to harvest some, using most of it for pickling and borscht. On that same bike trip, I stopped at Laura’s to unload some goodies on her hens. That morning I had cut back my severely cabbage worm-infested collards. I brought over the collard leaves, creepy crawlies and all, for the chickens‘ enjoyment. Laura sent me home with heirloom tomatoes and a photograph of the hens posing for a family portrait. I promptly put the maca in a green drink, the one I’m sipping right now. It also contains: frozen blueberries (brought back from Michigan by Anna), whey (received from Corinna down the street who makes her own Greek-style yogurt), lettuce (from farmers market), and kale (from my garden). To add further depth to this web of connection: Laura was the source of my kale seedlings, a late-summer addition to my garden and currently the focal point of my daily worm-picking meditation. I no longer squish or stomp the worms while grimacing and/or squealing. I save them for Laura’s hens. 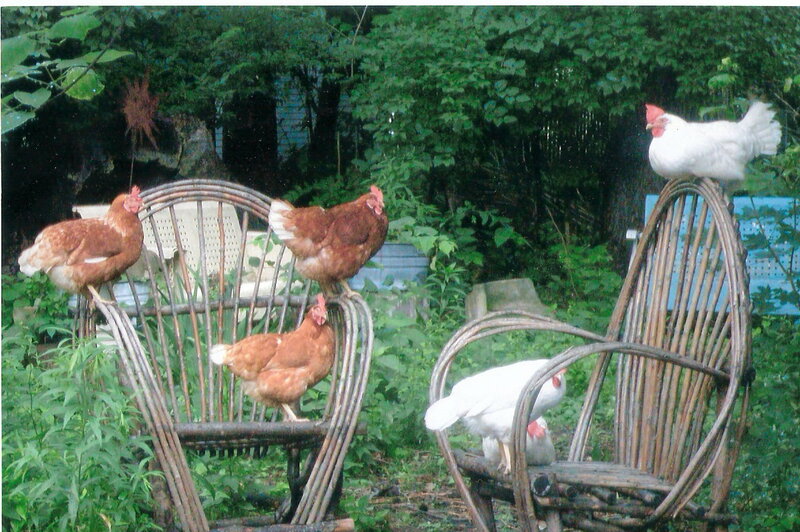 The very hens that supply my eggs. Writing this, I’m realizing my good fortune: my indebtedness extends even beyond my human neighbors. What precious debts have you incurred in your community? This entry was posted in Books, The Big Picture and tagged Alternative Currency, Bartering, DIWO, Do-it-with-others, Garden, Gift Economy, Local food, mindfulness, Rebecca Solnit, resilience. Bookmark the permalink.